A 52-year-old woman presented at our department for progressive dysphagia for almost 1 year, with food vomiting. An esophagoscopy showed a polypoidal mass, 25 cm from the incisors, in the middle third of the esophagus. Biopsy confirmed the presence of a squamous cell carcinoma shown in Figure 1. 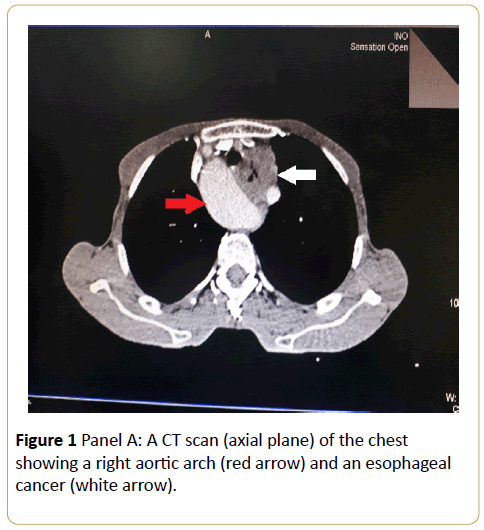 Figure 1: Panel A: A CT scan (axial plane) of the chest showing a right aortic arch (red arrow) and an esophageal cancer (white arrow). Computed tomography showed an ulcerative tumor in the esophageal wall, measuring 50 mm × 23 mm × 73 mm, 8 cm from the cardia with intimate contact with the trachea, the keel and the left pulmonary artery (Panel A) shown in Figure 2. Figure 2: Panel B: Computed tomography (coronal plane) revealing a right aortic arch (white arrow). CT revealed also a right aortic arch, classified as an aortic anomaly of type III-A: A mirror image branching of the normal left aortic arch, according to Edward’s classification (Panel B). Type IIIB is the most frequent, followed by Type IIIA. The classification of aortic anomalies by Edward’s et al. is based on their theoretical concept of the development of the aortic arch. 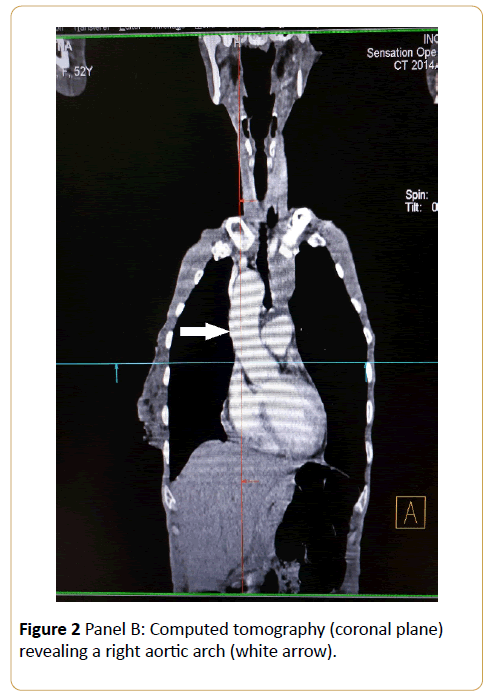 Right aortic arch is a rare condition, this congenital vascular anomaly is thought to occur in approximately ~0.1% (Range 0.05% to 0.2%) of the population, and it is reported to represent from 1% to 2% of congenital diseases of the heart and aorta. In patients with a right aortic arch, the aorta surrounds the esophagus and trachea, causing the compression and deviation of these structures, as well as deviation of the recurrent laryngeal nerve. This is why great care must be taken when the surgical option is decided. The main symptom of right aortic arch is dysphagia, due to compression of the esophagus by the vascular ring created by the arch. In our case, dysphagia was not noted prior to the development of the cancer. Esophageal cancer associated with right aortic arch is very rare, only few cases have been cited in the literature; the squamous carcinoma cell is the most common type. The surgical resection in this rare combination is very rare, but some cases have been reported in the literature. A right thoracotomy is the most common approach for the resection of the esophageal cancer, but in the presence of a right aortic arch, we prefer a left thoracotomy. The mean age was 62 years. After multidisciplinary board meeting, she benefited from a jejunotomy tube. An exclusive chemoradiation was provided, but given the alteration of the general state, important weight loss (10 Kg in 3 months, her actual weight is 35 kg), and tumor progression, a palliative radiation was decided (30 Gy, 3Gy per fraction). Palfai TP, Monti PM, Ostafin B, Hutchison K (2000) Effects of nicotine deprivation on alcohol-related information processing and drinking behavior. J Abnorm Psychol 109: 96-105. Harrison EL, Hinson RE, McKee SA (2009) Experimenting and daily smokers: episodic patterns of alcohol and cigarette use. Addict Behav 34: 484-486. Howell A, Leyro T, Hogan J, Buckner J, Zvolensky M (2010) Anxiety sensitivity, distress tolerance, and discomfort intolerance in relation to coping and conformity motives for alcohol use and alcohol use problems among young adult drinkers. Addictive Behaviors 35:1144-1147. Krukowski RA, Solomon LJ, Naud S (2005) Triggers of heavier and lighter cigarette smoking in college students. J Behav Med 28: 335-345. Reed MB, Wang R, Shillington AM, Clapp JD, Lange JE (2007) The relationship between alcohol use and cigarette smoking in a sample of undergraduate college students. Addictive Behaviors 32: 449-464. Hughes JR, Kalman D (2006) Do smokers with alcohol problems has more difficulty quitting? Drug Alcohol Depend 82: 91-102. Hurt RD, Offord KP, Croghan IT, Gomez-Dahl L, Kottke TE, et al. (1996) Mortality following inpatient addictions treatment: Role of tobacco use in a community-based cohort. JAMA: Journal of the American Medical Association 275: 1097-1103. Lisha NE, Carmody TP2, Humfleet GL2, Delucchi KL2 (2014) Reciprocal effects of alcohol and nicotine in smoking cessation treatment studies. Addict Behav 39: 637-643. Taylor B, Rehm J (2006) When risk factors combine: The interaction between alcohol and smoking for aerodigestive cancer, coronary heart disease, and traffic and fire injury. Addictive Behaviors 31: 1522-1535. Jarvis CM, Hayman LL, Braun LT, Schwertz DW, Ferrans CE, et al. (2007) Cardiovascular risk factors and metabolic syndrome in alcohol- and nicotine-dependent men and women. J CardiovascNurs 22: 429-435. Joseph AM, Willenbring ML, Nugent SM, Nelson DB (2004) A randomized trial of concurrent versus delayed smoking intervention for patients in alcohol dependence treatment. Journal of Studies on Alcohol, 65: 681-691. Kodl M, Fu SS, Joseph AM (2006) Tobacco cessation treatment for alcohol-dependent smokers: when is the best time? Alcohol Res Health 29: 203-207. Fu S, Kodl M, Willenbring M, Nelson D, Nugent S, et al. (2008) Ethnic differences in alcohol treatment outcomes and the effect of concurrent smoking cessation treatment. Drug and Alcohol Dependence 92: 61-68. Holt LJ, Litt MD, Cooney NL (2012) Prospective analysis of early lapse to drinking and smoking among individuals in concurrent alcohol and tobacco treatment. Psychology of Addictive Behaviors 26:561-572. Centers for Disease Control and Prevention (CDC) (2009) Cigarette smoking among adults and trends in smoking cessation - United States, 2008. MMWR Morb Mortal Wkly Rep 58: 1227-1232. Irving LM, Seidner AL, Burling TA, Thomas RG, Brenner GF (1994) Drug and alcohol abuse inpatients' attitudes about smoking cessation. J Subst Abuse 6: 267-278. Macnee CL, Talsma A (1995) Development and testing of the barriers to cessation scale. Nurs Res 44: 214-219. Orleans CT, Rimer BK, Cristinzio S, Keintz MK, Fleisher L (1991) A national survey of older smokers: treatment needs of a growing population. Health Psychol 10: 343-351. Kristeller JL (1994) Treatment of hard-core, high-risk smokers using FDA approved pharmaceutical agents: An oral health team perspective. Health Values 18: 25-32. Asher MK, Martin RA, Rohsenow DJ, MacKinnon S, Traficante R, et al. (2003) Perceived barriers to quitting smoking among alcohol dependent patients in treatment. Journal of Substance Abuse Treatment 24: 169-174. Martin RA, Rohsenow DJ, MacKinnon SV, Abrams DB, Monti PM (2006) Correlates of motivation to quit smoking among alcohol dependent patients in residential treatment. Drug Alcohol Depend 83: 73-78. Marlatt GA, Gordon JR (1985) Relapse prevention. New York: Guilford Press. Velicer WF, DiClemente CC, Prochaska JO, Brandenburg N (1985) Decisional balance measure for assessing and predicting smoking status. J PersSoc Psychol 48: 1279-1289. DiClemente CC, Prochaska JO (1982) Self-change and therapy change of smoking behavior: a comparison of processes of change in cessation and maintenance. Addict Behav 7: 133-142. Curry SJ, Grothaus L, McBride C (1997) Reasons for quitting: intrinsic and extrinsic motivation for smoking cessation in a population-based sample of smokers. Addict Behav 22: 727-739. Baha M, Le Faou AL (2010) Smokers' reasons for quitting in an anti-smoking social context. Public Health 124: 225-231. Curry SJ, McBride C, Grothaus LC, Louie D, Wagner EH (1995) A randomized trial of self-help materials, personalized feedback, and telephone counseling with nonvolunteer smokers. J Consult Clin Psychol 63: 1005-1014. Saunders JB, Aasland OG, Babor TF, de la Fuente JR, Grant M (1993) Development of the Alcohol Use Disorders Identification Test (AUDIT): WHO Collaborative Project on Early Detection of Persons with Harmful Alcohol Consumption--II. Addiction 88: 791-804. First MB, Williams JB, Spitzer RL, Gibbon M (2002) Structured Clinical Interview for DSM-IV-TR Axis I Disorders, Clinical Trials Version (SCID-CT). New York: Biometrics Research, New York State Psychiatric Institute. Brown RA, Lejuez CW, Kahler CW, Strong DR (2002) Distress tolerance and duration of past smoking cessation attempts. J Abnorm Psychol 111: 180-185. Heatherton TF, Kozlowski LT, Frecker RC, Fagerström KO (1991) The Fagerström Test for Nicotine Dependence: a revision of the Fagerström Tolerance Questionnaire. Br J Addict 86: 1119-1127. Pomerleau CS, Carton SM, Lutzke ML, Flessland KA, Pomerleau OF (1994) Reliability of the Fagerstrom Tolerance Questionnaire and the Fagerstrom Test for Nicotine Dependence. Addict Behav 19: 33-39. Fagerstrom KO, Heatherton TF, Kozlowski LT (1990) Nicotine addiction and its assessment. Ear Nose Throat J 69: 763-765. Filbey FM, Claus E, Audette AR, Niculescu M, Banich MT, et al. (2007) Exposure to the taste of alcohol elicits activation of the mesocorticolimbicneurocircuitry. Neuropsychopharmacology 33: 1391-1401. Fleming MF, Barry KL, MacDonald R (1991) The alcohol use disorders identification test (AUDIT) in a college sample. Int J Addict 26: 1173-1185. Cherpitel CJ (1995) Analysis of cut points for screening instruments for alcohol problems in the emergency room. J Stud Alcohol 56: 695-700. Macnee CL, Talsma A (1995) Predictors of progress in smoking cessation. Public Health Nurs 12: 242-248. Curry S, Wagner EH, Grothaus LC (1990) Intrinsic and extrinsic motivation for smoking cessation. J Consult Clin Psychol 58: 310-316. McBride CM, Pollak KI, Bepler G, Lyna P, Lipkus IM, et al. (2001) Reasons for quitting smoking among low-income African American smokers. Health Psychol 20: 334-340. Bonn-Miller MO, Zvolensky MJ (2009) An evaluation of the nature of marijuana use and its motives among young adult active users. Am J Addict 18: 409-416. Buckner JD, Zvolensky MJ, Schmidt NB (2012) Cannabis-related impairment and social anxiety: the roles of gender and cannabis use motives. Addict Behav 37: 1294-1297. Agrawal A, Budney AJ, Lynskey MT (2012) The co-occurring use and misuse of cannabis and tobacco: a review. Addiction 107: 1221-1233. Degenhardt L, Hall W, Lynskey M (2001) The relationship between cannabis use and other substance use in the general population. Drug Alcohol Depend 64: 319-327. Cohen J, Cohen P (1983) Applied multiple regression/correlation analysis for the behavioral sciences. Hillsdale, NJ: Lawrence Erlbaum. Cohen J, Cohen P, West SG, Aiken LS (2003) Applied multiple regression/correlation analysis for the behavioral sciences (3rd ed.). Mahwah, NJ US: Lawrence Erlbaum Associates Publishers. Lipkus IM, Feaganes JR, Green JD, Sedikides C (2001) The Relationship Between Attitudinal Ambivalence and Desire to Quit Smoking Among College Smokers. Journal of Applied Social Psychology, 31: 113-133. Wilson SJ, Creswell KG, Sayette MA, Fiez JA (2013) Ambivalence about smoking and cue-elicited neural activity in quitting-motivated smokers faced with an opportunity to smoke. Addict Behav 38: 1541-1549. Festinger LA (1957) A theory of cognitive dissonance. Evanston, IL: Row, Peterson. Markowitz LJ (2000) Smoker's perceived self-exemption from health risks. Psi Chi Journal of Undergraduate Research 5: 119-124. Jamieson P, Romer D (2001)What do young people think they know about the risks of smoking? In P. Slovic (Ed. ), Smoking: Risk, perception, and policy (pp. 51-63). Thousand Oaks, CA US: Sage Publications, Inc.
Schane RE, Glantz SA, Ling PM (2009) Social smoking implications for public health, clinical practice, and intervention research. American Journal of Preventive Medicine 37: 124-131. DaniJA, De Biasi M (2001) Cellular mechanisms of nicotine addiction. PharmacolBiochemBehav 70: 439-446. Nestler EJ (2005) Is there a common molecular pathway for addiction? Nat Neurosci 8: 1445-1449. Ehrman RN, Robbins SJ, Bromwell MA, Lankford ME, Monterosso JR, et al. (2002) Comparing attentional bias to smoking cues in current smokers, former smokers, and non-smokers using a dot-probe task. Drug Alcohol Depend 67: 185-191. Kerst WF, Waters AJ (2014)Attentional retraining administered in the field reduces smokers’ attentional bias and craving. Wiers RW, Rinck M, Kordts R, Houben K, Strack F (2010) Retraining automatic action-tendencies to approach alcohol in hazardous drinkers. Addiction 105: 279-287. Raupach T, West R, Brown J (2013) The most "successful" method for failing to quit smoking is unassisted cessation. Nicotine Tob Res 15: 748-749. Korte KJ, Capron DW, Zvolensky M, Schmidt NB (2013) The Fagerström test for nicotine dependence: do revisions in the item scoring enhance the psychometric properties? Addict Behav 38: 1757-1763.